You are so excited. For the first time in your Christian walk, you have discovered a fruit of the Spirit in an area of your life in which you’d struggled for years. Just when you’d almost given up, you read John 15:5: “He who abides in Me, and I in him, bears much fruit.” Suddenly you understood that the whole concept of fruit-bearing was so simple: By staying in Jesus, letting His life flow through you, the fruit would naturally grow. Now it has actually happened. You are rejoicing, and you can’t wait to show the new fruit to your Heavenly Father. To your great joy, He lets you know that He will soon come to inspect the branch in your life that has produced fruit. You can hardly wait for His arrival and suspect that He will surprise you with a certificate or a reward for doing so well. But to your bewilderment, when He arrives He carries nothing but a pair of big pruning shears in His hands. What is He planning to do? Somehow you get the feeling that His idea of inspecting your fruit-bearing branch doesn’t exactly match your own expectations. John 15:2 tells us what God has in mind: “Every branch that bears fruit He prunes, that it may bear more fruit.” This means that He will not leave us alone but instead is determined to make us even more fruitful. His strategy is to begin a very deliberate pruning process by allowing us to encounter troubles, tribulations and difficulties. These adversities serve as His shears and pruning knife. That doesn’t sound like anything we would choose for ourselves. Often, our biggest concern is how much God is planning to cut off of our branch! But let me tell you about the tea plantations in my native country of India. Thousands of acres are covered with beautiful, lush, deep green plants. But if you were to visit these same tea estates during a certain time of the year, you would immediately think that something had gone very wrong. Instead of thriving bushes with healthy, growing leaves, you would only find naked little stumps with a few bare branches clinging to them. They look dead and hopeless. All of their beauty is gone. If you were to search for answers, you would find laborers with sharp knives and shears going from tree to tree and mercilessly cutting nearly everything off, while others continually haul away truckloads of green, leafy branches. This entry was posted in K.P. 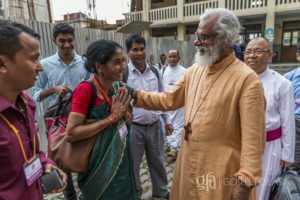 Yohannan and tagged Bridge of Hope, Dr. KP Yohannan, GFA, Gospel for Asia, KP Yohannan on February 3, 2011 by gfaseo.